Is JPMorgan Chase Stock a Buy Right Now? There are plenty of reasons to conclude that JPMorgan Chase is an attractive buy at today’s price. There are few industries that have suffered as much over the last decade as banks, causing their stocks to tumble. But this shouldn't be interpreted as a reason to avoid the space. As a cursory analysis of JPMorgan Chase (NYSE:JPM) shows, this is when enterprising investors want to think about adding these stocks to their portfolios. There's one reason that big bank stocks, like JPMorgan Chase, are compelling right now: valuation. Analysts and investors tend to value bank stocks by comparing their share prices to their book values per share. The typical bank in ordinary times will trade at or around one times book value, though this will vary over time as the prospects for the industry rise and fall with the business cycle. 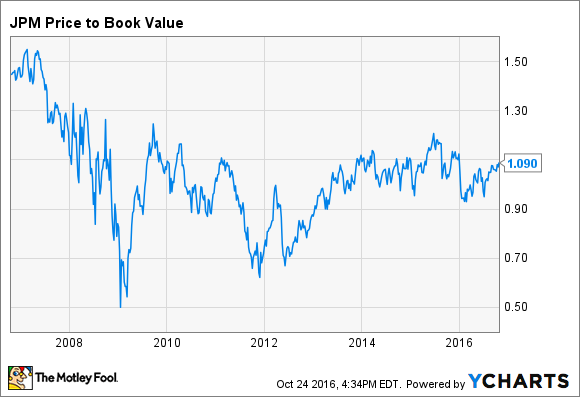 When times are great and banks are making a lot of money, bank stocks trade for two or more times book value. But when the economy takes a turn for the worse, fueling loan losses and thereby weighing on bank share prices, bank stocks will trade for meaningful discounts to book value. It's for that reason that bank investors try to adhere to the axiom: "buy at half of book value and sell at two times book value." Doing that is hard, as calling either the bottom or the top of the market is difficult, if not impossible. Yet, you don't have to get your timing exactly right to still benefit from this approach. Right now, JPMorgan Chase's shares offer a case in point. The nation's biggest bank by assets is trading for 1.1 times book value. That's not the bargain basement price that Bank of America or Citigroup are trading at -- approximately 30% below their respective book values -- but it's nevertheless reasonable when considering that JPMorgan Chase could easily trade for 1.5 times book value or higher in the years ahead. I say that because JPMorgan Chase is bound to make a lot more money when interest rates rise. There's no telling when that will happen, though chairman and CEO Jamie Dimon believes the Federal Reserve should do so sooner rather than later. Either way, it's safe to assume that higher rates are in the cards for the future. JPMorgan Chase even goes so far as to estimate how much this could help its top line. According to its latest quarterly filing with the Securities & Exchange Commission, a 100 basis point, or 1 percentage point, boost in rates would translate into $3 billion more net interest income. If rates rose by 200 basis points, it would generate $4.9 billion more net interest income from its asset portfolio. This would not only increase JPMorgan's profitability, it would also enable it to continue growing its already voluptuous dividend. The New York-based bank's shares yield 2.8%. That's the sixth highest among the nation's blue-chip bank stocks -- the roughly two dozen stocks on the KBW Bank Index -- and it's well above the 2.1% average yield on the S&P 500. While it's impossible to predict the future with any semblance of certainty, it's not unreasonable to think that JPMorgan Chase's shareholders will benefit as we proceed further and further away from the low interest rates produced by the financial crisis.